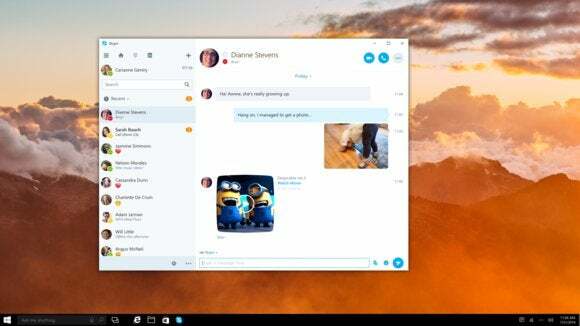 Microsoft began preparing for the eventual conversion of Skype into a Universal Windows Platform (UWP) app on Thursday. But as a preview app for Windows Insiders beta testers, Microsoft signaled that the process will be a measured one. Microsoft said Thursday that it would release a Skype Universal Windows Platform Preview app—but only for members of its Windows Insider beta program, ot the general public. Over time, Skype said, you should expect all of the Skype functionality to migrate into the UWP app, although the existing apps will remain for an undisclosed amount of time. The UWP app will include basic Skype features, which Microsoft said included the ability to sign in with a Microsoft account; see contacts and display your availability; chat, place calls and send messages; use emoticons; see notifications for those calls and messages; and group chat. Group messaging, calls, and screen sharing are next on the list, Skype said. 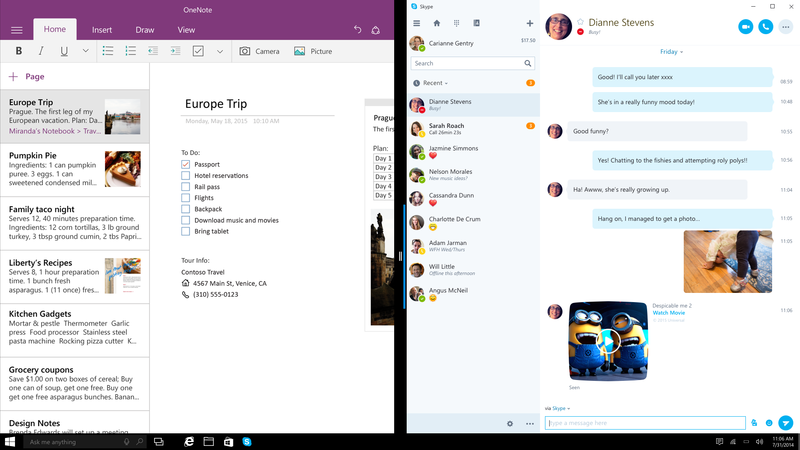 The UWP Skype app snapped side-by-side with Microsoft's OneNote app. Why this matters: There’s been a heightened level of concern about UWP apps in the recent past, and about whether Microsoft is using them to exert some level of unfair control over the PC. What’s lost somewhat in the debate is that, for some of Microsoft’s utility apps, a universal code base means that they can be quickly updated across all of Microsoft’s platforms: phones, PCs, the HoloLens, et cetera. Users should obviously be concerned that they’re going to lose some functionality in the process, and how dependent apps and plugins will be affected. But with a healthy Win32 app already in place, Microsoft can take its time—and it seems like that’s the plan. Video chats and messaging have traditionally lived within the Skype Win32 app. Microsoft began the separate UWP transition process in November with what it called its “consumer preview of Skype integration,” which actually dis-integrated the two key Skype functions, video and messaging, into two distinct apps: Skype Video and Skype Messenger, as part of a Windows 10 update. Microsoft didn’t say how long it would take for the native Skype apps to be phased out in favor of the UWP counterpart. But with no public timetable for, say, real-time translation to appear in the UWP version of the app, it’s probably safe to say that the transition will be slow and deliberate.